Haifaa Al-Mansour’s Mary Shelley has been long-awaited to hit theaters ever since its debut at TIFF last year. The story follows a young Mary Wollstonecraft Godwin and her love affair with writer Percy Shelley, who inspired her to write her greatest piece of work, Frankenstein. She was the daughter of political philosopher William Godwin and philosopher and feminist Mary Wollstonecraft. Mary creates the idea of Frankenstein when she visits the summer estate of writer Lord Byron, who suggests that everyone create their own ghost story one frightful evening. The film premiered to fairly mixed reviews, with more negative than positive. The story is most definitely worth telling even though Elle Fanning strikes us as questionable casting choice. Fanning has made quite a career playing the sort of new “Hollywood ‘It’ Girl” with her great performances in mature, young adult roles like 20th Century Women, The Neon Demon and The Beguiled. This role definitely looks like the 20-year-old is trying to break out of her mold right now and expand her range. 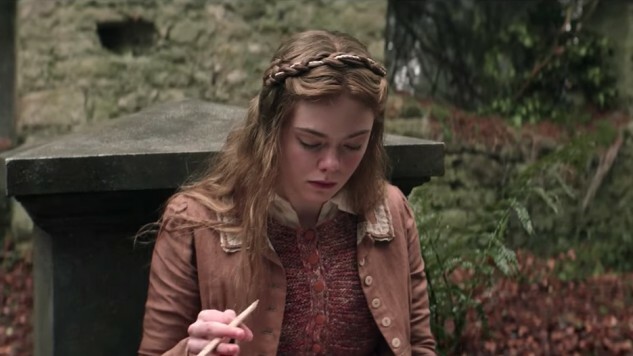 Judging from the trailer, this doesn’t exactly scream Oscar nomination, but it looks like it could be a step in the right direction for the talented young actress. Douglas Booth (Pride and Prejudice and Zombies, The Pillars of the Earth) also stars in the film as Percy Shelley, with Tom Sturridge (On the Road, Far From the Madding Crowd) playing Lord Byron. Maisie Williams (Game of Thrones), Bel Powley (The Diary of a Teenage Girl), Golden Globe winner Joanne Froggatt (Downton Abbey) and Stephen Dillane (The Hours, Game of Thrones) also star. The backstory behind the creation of Frankenstein comes alive in theaters on May 25 and on VOD on June 1. See the film’s first trailer and synopsis below. You can also see Fanning in the wacky trailer for How to Talk to Girls at Parties here.